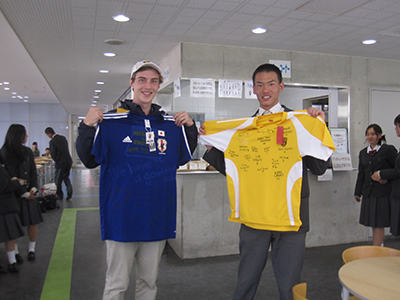 The soccer team at Padua College, our sister sister school in Australia, is currently on a soccer tour of Japan. During the 12-day tour, 18 boys and 4 teachers are touring the country to play several friendly matches and to learn about the culture through exchanges and sightseeing. During their visit to Nigawa Gakuin, they played a full match against our high school team, enjoyed a post-match cultural exchange with our students, took a tour of the school which involved a kendo demonstration by our vice principal Mr. Koyama, and had their first Japanese school lunch in the restaurant. This tour is the first opportunity for most of the students to visit Japan, an experience that is sure to be a memorable one in many ways. Moreover, our students showed a keen interest in not only the match, but also communicating (in English) with their new friends from Australia. Our sister school relationships are sure to offer students at Nigawa Gakuin many more such opportunities to learn about other cultures and deepen their understanding of the world. Thank you Padua. See you again! !